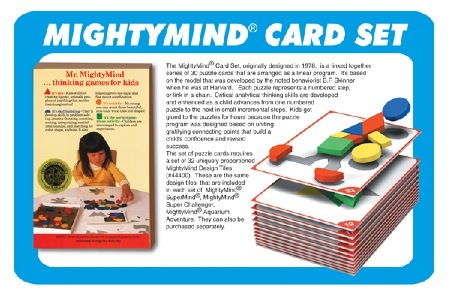 The MightyMind® Card Set, originally designed in 1978, is a linked together series of 30 puzzle cards that are arranged as a linear program. 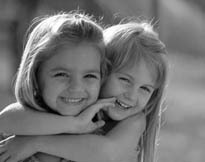 It’s based on the model that was developed by the noted behaviorist B.F. Skinner when he was at Harvard. Each puzzle represents a numbered step, or link in a chain. Critical analytical thinking skills are developed and enhanced as a child advances from one numbered puzzle to the next in small incremental steps. Kids get glued to the puzzles for hours because the puzzle program was designed based on uniting gratifying connecting points that build a child’s confidence and reward success. The set of puzzle cards requires a set of 32 uniquely proportioned MightyMind Design Tiles (#44400). These are the same design tiles that are included in each set of MightyMind®, SuperMind®, MightyMind® Super Challenger, MightyMind® Aquarium Adventure. They can also be purchased separately.